Let’s get this straight. 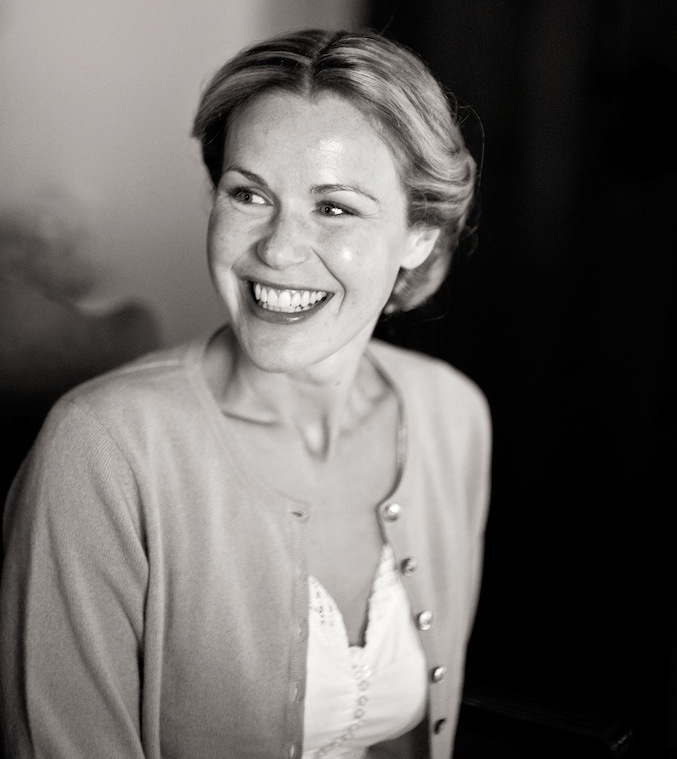 On most days and in most ways, it was better being the older sister. I got to stay up later earlier, had a hamster before she did and got my ears pierced years ahead. But in the midst of all my primogenito gloating there was one thing my sister had over me: Saint Lucy. And purely because her feast day on December 13th excluded my participation, it always seemed like the most magical and mystical day of the year. 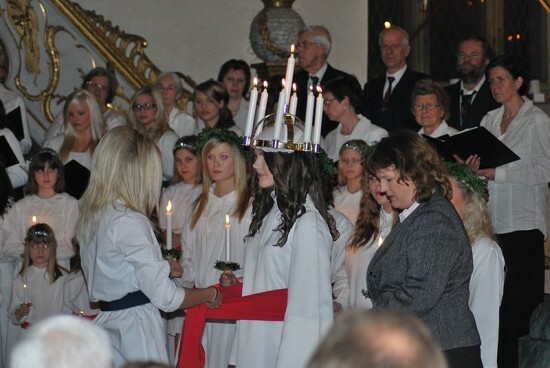 Following what is a northern European tradition, my sister would dress in a pretty white dress and process with a candle and small sack of sweets. 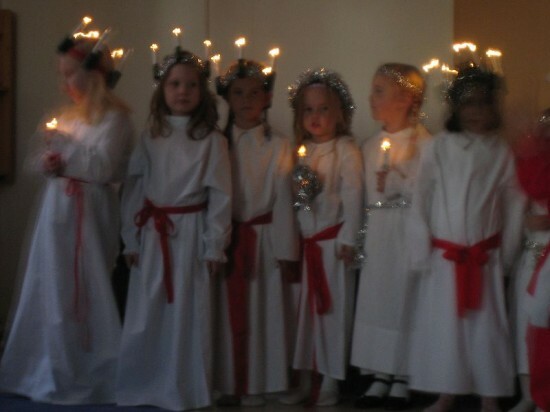 Our domestic celebration traced back to what is especially a Scandinavian observation in which “Saint Lucy” comes as a little girl with lights and sweets. Sometimes a procession might be headed by the Lucy figure sporting a crown of candles (but obviously this was too risky for a wriggly little customer like my sister). 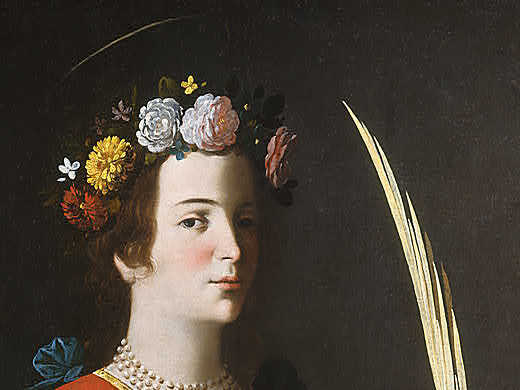 Although there are no sources on her actual life (other than the saintly accounts of the hagiographies) Lucy is believed to have been from Sicily, and to have died a martyr’s death in Syracuse around AD 310. 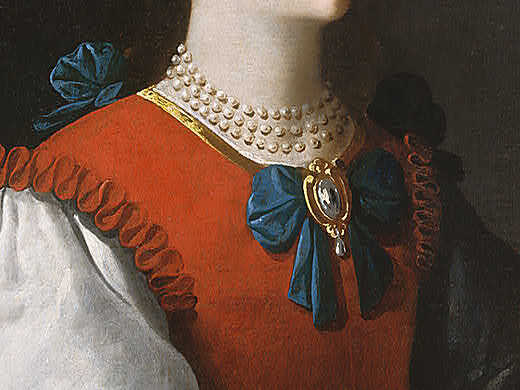 It’s thought that while working to help Christians hiding in the catacombs during the terror under the Roman Emperor Diocletian, and in order to bring with her as many supplies as possible, she needed to have both hands free: she solved the problem by attaching candles to a wreath on her head. 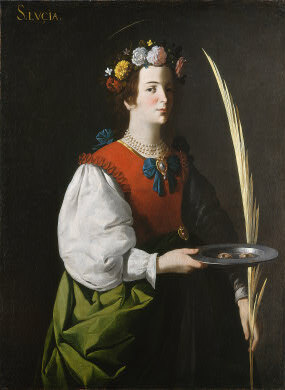 Our lovely Lucy today is offered by Francisco de Zurbarán, a Spanish artist of the 17th century (1598 – 1664). He rarely veered from holy subject matter and was essentially one of the greatest religious painters of his time. 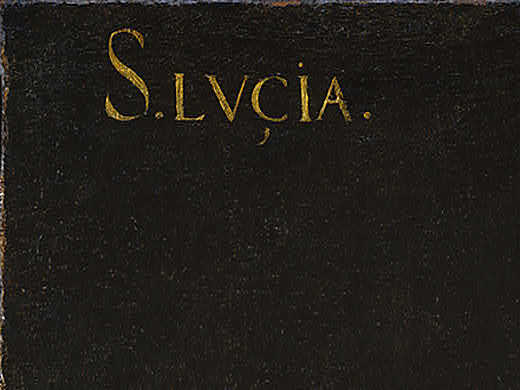 What’s so unusual here in this entrancing incarnation of the young female saint is that he’s loosened his typically austere and intensely spiritual tack to introduce her as a contemporary woman of Seville. She is certainly well-heeled: voluminous sleeve and skirts, hair coiffed with care and boasting some serious bling. 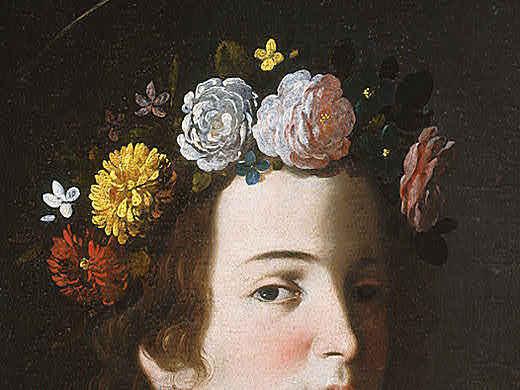 A bundled bouquet adorns her crown. Surely the success of this image leans on our identification with Lucy as a human woman who’s not half attractive. It’s Zurbarán’s skills as a colorist too that zing this onto a higher level, as well as his stark yet sensual light-and-shade play. 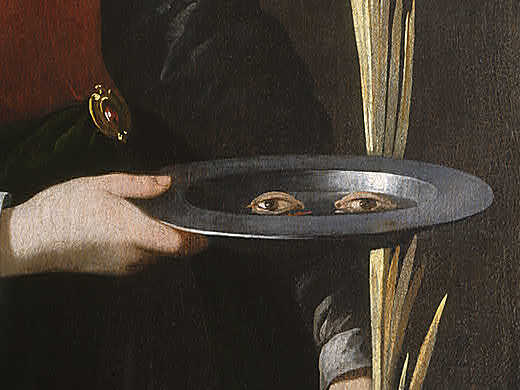 Lots of legends surrounding Lucy launched in the time of the Counter Reformation, the most popular linking to her eyes. Say some, she plucked them out herself as men found them to be alluring and our Lucy had intentions of staying chaste and pure. 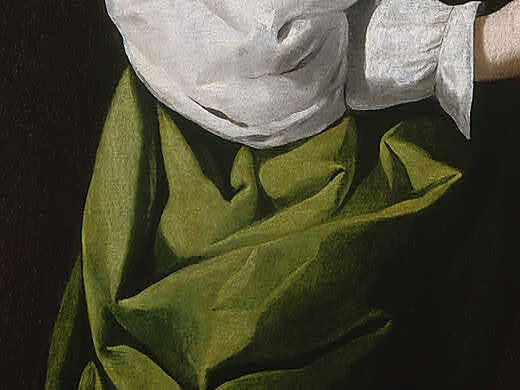 Eviscerated eyes make for the most gory of attributes, but I must say that Zurbarán takes even these in his stride.